Splinter meditates, and tracks down Bloodsucker, who is working his way ever further upstream. Splinter is then carried through the swamps and wilderness to where the river is born, where he finds the aged form of The One Who Waits. Casey and April are working on the Chevy, which has broken down again. Mike announces that they’re stuck and Don informs him that Abanak has found a canoe under the brush of the nearby river. The coincidence is hard to grasp, but Abanak says that it’s a sign that the Old Man is helping them, and that he saw it in a dream. The boat only carries four, so April and Casey are forced to stay with the car. The pair say that they’ll get the vehicle fixed and wait for the Turtles to return. Suddenly everyone notices that Raph is missing, and a frantic search begins. Leonardo spots Raph, who is facing a weasel. Don exclaims that they have to help Raphael, but Leo refuses… for although Raph has been reverted back to a pet shop turtle, he’s still Raphael. Sure enough, Raph bites the weasel on the neck and the animal flees in pain. The Turtles and Abanak head up river in the canoe. Abanak tells the boys about the Old Man, who has always been here and knows all. Abanak has seen the Old Man in his dreams and knows that he exists, and that he can help. As our heroes head upstream, Bloodsucker stalks them from the trees above. Suddenly, the canoe overturns and everyone is surprised to find thousands of fish in the stream. As Don rises to his feet, he’s amazed to find that the fish have lifted him out of the water and he’s riding on their backs! “I think we’re about to go for the ride of our lives!” the brainy terrapin announces. No sooner has Donatello made his remarks than everyone is hauled upriver on the backs of the fish, water skiing without boat or line. The fish even carry the group up a waterfall! The crew is dropped off by a large, flat stone. Abanak states that this is as far as his dreams have revealed the land to him. He believes that the rock is called the Wisdon Stone, and that they should stand upon it. The Turtles are uneasy, feeling like they could be walking into a trap. Mike spots ornaments in the pine trees, and as he muses whether or not the Old Man celebrates Christmas, the stones speak to him, telling him that they were placed here by druids, long before Christianity existed. Alarmed by the talking ornaments, the TMNT back into defensive position, which places them onto the Wisdom Stone… which bursts brightly with energy. The Old Man has appeared on the Wisdom Stone, and he explains that he has lived so long that he is now the river, and it is he. He tells the tale of an ancient, technologically advanced civilization that thrived but destroyed itself during the age of dinosaurs, and how the few that survived swore off technology and embraced the Earth, soon unlocking her deepest secrets. They learned that the rivers were conduits of planetary energy, powerlines that helped them gain all knowledge of the physical world. Eventually, the survivors transcended flesh and merged with the rivers, so that there is one for each of the world’s waterways… and they’re still searching for knowledge, still hungry to learn all that is new. The Turtles ask the Old Man if he can help Raphael change back, and the ancient one states that he probably could, as he’s the one responsible for the regression in the first place, since he is the river and all its creatures. Just then Bloodsucker arrives. The Turtles are upset that the Old Man sent this abomination after Raphael, while the river master muses what is more of an abomination, a mutant leech, or a mutant turtle? Leonardo demands to know why the Old Man orchestrated these events, and the archaic being explains that back when the Turtles first reached his waters and longed to know what their lives would be had they remained normal turtles, he too felt their pangs, as well as his own, to know what they were… for the Turtles were the first mutants that he had ever encountered. The Old Man states that the Turtles were something new to the river, and that he must study them very thoroughly. Donatello says that they aren’t the type who like to be studied and tells the river master to change Raph back and they’ll be on their way. The Old Man says that he believes Raphael is happier as he is, and that he thinks all four would be happier if they would return to their natural form. The Turtles get angry and brandish their weapons, which angers the river god… who unleashes great power throughout the entire waterway. The burst of energy also snaps Master Splinter’s mind, thus giving control of the Sensei to the Old Man, who uses his newfound ability to mesmerizie the Turtles. While the TMNT stand frozen, Bloodsucker grabs them and prepares to feed on them. Abanak argues for their lives, which only angers the Old Man more. As the ancient one berates Abanak, Raphael bites him on the finger. Bemused, the Old Man tosses Raph into the river. As Bloodsucker savors the Turtles, Raph swims over and bites him on the toe. The monster raises its leg in bewilderment, causing it to lose its balance, whereby it tumbles over the falls with all four Turtles in tow. Abanak grows angry and tells the Old Man that he is petty and greedy, just like all the men who have sought control of the river. He lifts Leo’s katana and attacks the ancient being, only to be blasted into the trees with a bolt of energy. As the Old Man is distracted by Abanak, Splinter is able to break free of the river master’s psychic grasp. Splinter realizes that the power that the river holds is the power of life itself, and then he braces to make his attack. Cut to the caverns near the city, where we see the fishing boys dutifully carving effigies in the stone. We discover that Officer Mannigan was sentenced to 20 years hard labor, and that it will take that long to clean up the river. The boys sense something and look up, to see a bolt of energy zooming up the river. Casey and April are still working on the car. As their frustrating task nears completion, Casey feels the ground shake and they rise to see the bolt of lightning careening overhead. Back at the base of the river, the Old Man catches the full force of Splinter’s attack. The river master realizes too late that he’d forgotten about the rat… and Splinter was able to utilize the power of the river to cut off the ancinet one’s life-giving supply of atoms. The Old Man crawls to the shore. Leonardo is sitting in the waterfall… he’s groggy and having trouble remembering why he’s here, when suddenly he’s attacked by Bloodsucker. As Leo fights for his life, Michaelangelo arrives to assist him. 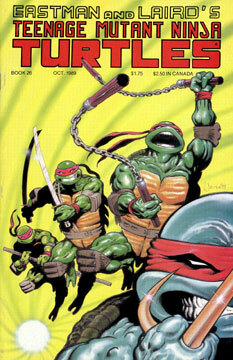 Donatello joins the fray, but all three are overpowered and tossed aside. However… Raphael clings to the monsters face, and when the beast shakes its head to free itself from Raph’s grasp, a portion of its mouth is torn free. The Old Man struggles on shore to regain control over his failing body. Abanak emerges from the woods, and the ancient river master begs for his assistance. When Abanak states that he’s no sorceror, the Old Man tells him that he has the power, but he was never informed because the ancient one feared that Abanak would use his abilities to ursurp the river master. The Old Man reverts to the form of an infant and pleads with Abanak to stop Splinter’s attack. Abanak stands silently as he watches the Old Man shrink into nothingness. Bloodsucker is holding the Turtles’ heads underwater, trying to drown them. Leonardo manages to flip the behemoth and free his brothers. As Bloodsucker rises from the depths, he is attacked by a large turtle… Raphael? Bloodsucker flees behind the falls, the giant turtle biting into his neck. As Mike and Don suggest that they should go in and help Raph, Leonardo refuses. “This is the way he’d want it.” the leader states. From behind the falls we hear mewing… as a shadowy form begins to emerge from behind the curtain of water. Finally, Raphael bursts into sight, “Mew my arse.” he growls. The brothers embrace in glee, and they ask Raph how he did it. Raphael explains that each time that he bit into the mutant leech’s hide, he felt a little better… so he continued to chow down until he’d regained all of his vital fluid back. Leonardo asks what happened to Bloodsucker, and Raph produces a normal leech… now that Bloodsucker himself had been drained, he turned back into his former self. Raph then pretends that he’s going to attach the leech to one of his brothers, who all freak out. “Kill it! It’s dangerous!” they scream. Raph explains that it’s harmless now and just wants to get back to its normal business, so the Mutant Turtle drops it back into the river. Just then they’re confronted by a robed figure they mistake for the Old Man. However, it turns out to be Abanak, who has assumed the role of river master. Abanak states that both of their quests have come to an end, but the Turtles demand to know who’s side he’s on, since he lead them into the trap. Abanak replies, “The river’s.” and then he conjures the fish, which carry the TMNT back to where April and Casey are. The car is finally repaired, but the fish ride isn’t stopping! As they pass, the Turtles call out to their friends that they’ll see them back in Northampton. Back in the city, the boys have finished their carvings… of their own faces! They feel that this shows the world that they’re serious about their duties, and they plan to protect the river from now on. Suddenly the Turtles go zooming by, and they send Abanak’s greetings to the lads and tell them that they’ll be contacted by the new river master soon… via their dreams. Back in Northampton, the Turtles meet Master Splinter. They’re jubilant over their victory and excited to celebrate, but the Sensei greets them with cold silence. The four quiet down nervously, and bow to their Master. Master Splinter bows back.